Stuart Rome has been busy strengthening our side for the campaign ahead. There's a few new faces and a few returning ones. Goalkeeper Vinnie Jones has been signed from Threave Rovers as has right back Greig Goodwin who returns. Another old player, Andrew Trestianu, has been signed from Aspatria. Sean Law is another from Aspatria. Dean Crozier and Dean Douglas join from Celtic Nation, Dean Smith has signed from Queen of the South, Conor Casey has joined us from Northbank. A number of other faces old and new have been training with the squad in pre-season and will be announced. 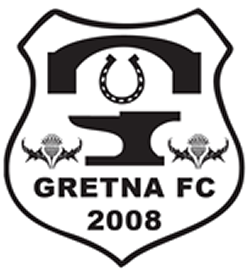 Gretna FC 2008 play Fleet Star in a friendly tomorrow, Saturday 4th July. Admission is free so tell your friends! We last met Fleet Star in the South Challenge Cup in 2012 when we ran out 12-3 winners.